Visiting Venice during the city’s worst spate of flooding for 22 years, this group of MTA – Mobile Travel Advisors made a beeline for the nearest gumboot shop to make sure they didn’t miss the opportunity to fully explore ‘La Serenissima’ (the most serene) as the city is affectionately known. The group’s visit was part of an exclusive Uniworld boutique river cruise collection ‘Gems of Northern Italy’ study tour. 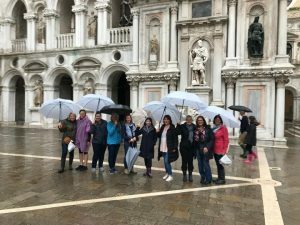 Attached image – pictured in a very damp Piazza San Marco (from left to right): Uniworld national sales manager Alice Ager, MTA Advisors Alicia Pringle and Deb Johnson, Uniworld reservations, team leader Renee Rowlands, MTA Advisors Val Berman, Di Russo, Wendy Gunther, Michelle Ramplin and MTA head office product team member Anne Mullins.